While it is easy to confuse the recent jihadi attack on Egypt’s St. Mark Cathedral in Cairo as just more of the usual, this attack has great symbolic significance, and in many ways bodes great evil for Egypt’s millions of Christians. Unprecedented: one of Christendom’s most sacred sites turned into a war zone under the Muslim Brotherhood’s President Morsi. Consider some facts: St. Mark Cathedral—named after the author of the Gospel of the same name who brought Christianity to Egypt some 600 years before Amr bin al-As brought Islam by the sword—is not simply “just another” Coptic church to be attacked and/or set aflame by a Muslim mob (see my forthcoming book, Crucified Again: Exposing Islam’s New War on Christians, for a comprehensive idea of past and present Muslim attacks on Coptic churches). Instead, it is considered the most sacred building for millions of Christians around the world—above and beyond the many millions of Copts in and out of Egypt. As the only apostolic see in the entire continent of Africa, its significance and evangelizing mission extends to the whole continent, including nations such as Sudan, Ethiopia, Libya, Tunisia, Morocco, and Algeria, to name just a few. As an apostolic see—the actual seat of an apostle of Christ—the cathedral further possesses historical significance for Christianity in general. In short, Muslim mobs—aided and abetted by the state of Egypt under Muslim Brotherhood tutelage—did not merely attack yet one more Coptic church, but rather committed an act of war against all Christianity. Such an open attack on a Christian center which holds symbolic and historic significance for all Christians—St. Mark, whose relics are in the cathedral and who authored one of the four Gospels of the Bible, belongs to all Christians not just Copts—was an open attack on a universally acknowledged Christian shrine. It was precisely these sorts of attacks on Eastern and Orthodox churches—including the destruction of the Church of the Resurrection in Jerusalem in 1009—that presaged the way for the crusades (back when Christianity was not utterly fragmented and disunited as it is today). Put differently, this jihadi attack on St. Mark Cathedral is no different for Copts than a jihadi attack on the Vatican would be for Catholics. Or, to maintain the analogy, but from the other side, it would be no different than a “crusader” attack on the Grand Mosque of Mecca for Muslims. While one can only imagine how the world’s Muslims would react to a “Christian/Western” assault on their most sacred of shrines, “post-Christian” Western leaders, as usual, stand idly by (not unlike Egyptian state security, which stood idly by as the Muslim mob opened fire on the cathedral). 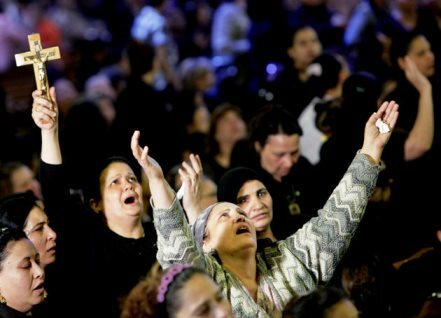 As for Egypt’s Copts, they certainly did rally to the defense of Egypt’s, if not the entire continent of Africa’s, most important cathedral—hence the draconian response from Egypt’s interior ministry (one eyewitness said security intentionally fired 40-50 gas bombs into the compound, knocking out many Christians, including several women and children). Just as Egyptian forces were wroth with Copts when they demonstrated against the ongoing attacks on their churches in Maspero in 2011—slaughtering over 20 Christians, including by intentionally running them over with armored-vehicles—it appears that Egyptian forces were quite irked with “dhimmi” Copts boldly defending their holiest site. On the other hand, that Copts rallied to the defense of their cathedral—or, as Reuters characterized them, “an angry young fringe … of Christianity may also be turning to violence—has further validated the Western mainstream media narrative that Egypt’s Christian minority is somehow equally violent and responsible for the so-called “sectarian strife”—euphemism for Muslim persecution of Christians—plaguing Egypt. Egyptian Christians plead with their Lord during the funeral of slain Copts at the St. Mark Cathedral — right before being attacked again, including by the state. Instead of words—which, from Islamists, are absolutely worthless—what Morsi needs to address is the fact that the most unprecedented and symbolically lethal attack on a Christian place of worship in post “Arab Spring” Egypt took place right under his and the Muslim Brotherhood’s authority (under Hosni Mubarak, “not so much as a pebble”—as one activist put it—was thrown at the St. Mark Cathedral, a national landmark). This of course is consistent with the fact that, unlike all former Egyptian presidents, who were all Muslim, Islamist President Morsi is the first president to refuse to enter a church—whether during the ceremonious installation of the nation’s new pope or whether during Coptic Christmas ceremonies. Could this be because the pious Morsi believes that a Christian church is like “a nightclub, [or] a gambling casino” as a prominent Egyptian fatwa council declared? Could it be that he, like other popular Muslim leaders, simply hates and is disgusted by Christians?